St. Bernards | MWAH! S&P Shakers Figurines | One Price Low Flat Shipping! From Westland Giftware's Mwah! Salt and Pepper Shakers Collection, St. Bernards. Made of ceramic with glossy finish. Measures 3.75" tall. Hand wash only. 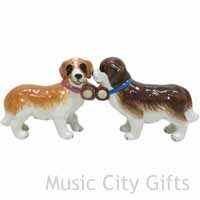 This 2 piece salt and pepper shakers set features a light brown and white Saint Bernard dog getting a kiss on the cheek by a dark chocolate colored one of the same breed. They both are wearing a traditional keg barrell around their neck. A strong small magnet holds these two kindred souls together.